What is the diamond problem and what is the virtual base class in C++? What is the diamond problem and what is the virtual base class in Cpp? Let us see at below diagram, which helps us in explaining the diamond problem. In the above picture we have 2 classes B and C that derive from the class – A. We also have class D that derives from both B and C by using multiple inheritance. The compiler will gets confused that from which base it need to take. In the code above, we’ve given a more concrete example of the diamond problem. 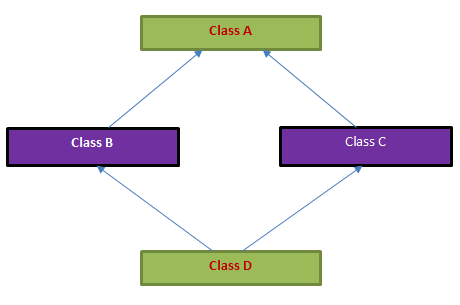 The MyBaseClass class corresponds to the topmost class in the hierarchy (A in our graphic above), MyDerivedClass and MyDerived2Class respectively correspond to B and C in the graphic, and the MyDerived3Class class corresponds to D.
In our inheritance hierarchy, we can see that both the MyDerivedClass and MyDerived2Class classes derive from the MyBaseClass base class. And here is the problem: because MyDerived3Class derives from both the MyDerivedClass and MyDerived2Class classes, which each have their own copy of the data members and methods of the MyBaseClass class. At the end the the MyDerived3Class class object ocClas will contain two object of the MyBaseClass base class. What is the solution to the Diamond Problem? The below is the solution for the diamond problem. If the inheritance from the MyBaseClass class to both the MyDerivedClass and MyDerived2Class class is marked as virtual, then C++ will ensure that only one sub object of the MyBaseClass class will be created for every MyDerived3Class object. Let us have a look into the example. Copy and compile it.